Earlier today, we had compared the Rs. 149 & Rs. 303 plan offered by Reliance Jio with Airtel‘s Rs. 145 & Rs. 345 plans. While Airtel’s plan looks way better on paper, in actuality, the Reliance’s plan is the best one to go for. However, soon after Reliance Jio announced the new plans, we started seeing a ton of other tariff plans from other telecom providers as well. This got a lot of people confused, and so we decided to do a quick comparison between all the plans that are now being offered in and around the same price bracket. Just like Jio’s Rs. 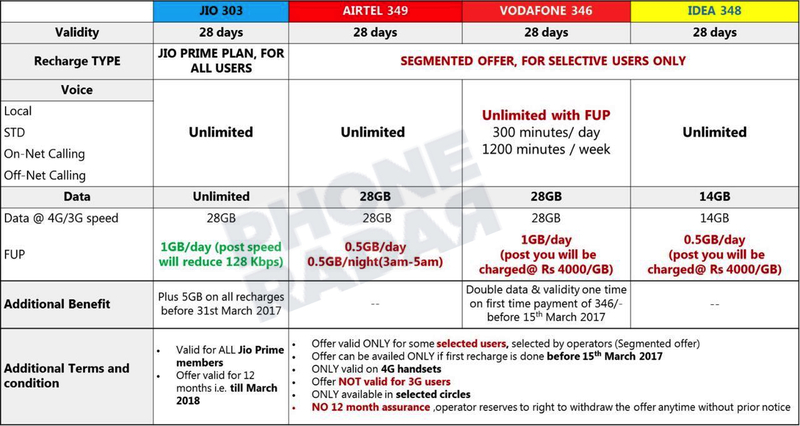 303 plan, Airtel, Vodafone and Idea Cellular has now announced new plans around the same price bracket. All the plans are valid for 28 days and will offer unlimited voice calling (except Vodafone where we have a FUP). All of them also give us The image attached below will give you a better idea of what exactly are we dealing here with and what are the different plans which we have on the table in front of us. Taking a look at the plans, as we all know that Jio is offering the same Rs. 303 plan under which you will get 1GB data per day for 28 days along with unlimited voice calls to any network. To beat this, pretty much all the telecom providers came up with a new plan, and the Airtel’s plan offers unlimited voice calls with 1GB data per day. But then even out of the 1GB plan, only 500MB can be used in daytime whereas the other 500MB can be used in the night from 3 A.M to 5 A.M.
Vodafone, on the other hand, is providing a Rs. 346 plan with unlimited calls with FUP of 300 minutes/day or 1200 minutes/ week. With Vodafone also you will be getting 28GB internet i.e. 1GB per day. Here there are no such limitations on the usage timings. However, post-1GB you will be charged 4000 INR/GB. Vodafone is probably calculating this per KB, and hence we have this totally off value. Vodafone is also giving double data and validity one time on the first recharge before 20th March. Idea Cellular is also offering a Rs. 348 plan where users will get unlimited calls with no strings attached. But they are offering only half the data i.e. 14GB for 28 days. You are also restricted to use 0.5GB per day post which again you will be charged 4000/ per day. Idea Cellular, however, is not offering any bonus offer here like Jio or Vodafone. Also, do make a note that the plan offered by Airtel, Vodafone, Idea is for selected users only. Also, this offer is not valid for 3G users and is only limited to selected users. Let us know what do you think about the different plans offered by these telecom operators. Would you prefer any other telecom provider or would you stick to Jio? Be sure to let us know in the comment section and also stay tuned to PhoneRadar for more info like this.